Human health—and human disease—have always been intimately connected to the environment. The environment contains the positive, in the form of air, water, and nutrients, and the negative, in the form of bacteria, viruses, and toxins. Humans have developed elaborate defense systems to protect against adverse environmental effects. These include immune systems that attack bacteria and other foreign bodies, DNA repair enzymes that defend the integrity of genetic structure, and metabolizing enzymes that degrade ingested compounds and prepare them for excretion. When these systems become overwhelmed or operate inefficiently, disease and death can occur. The awareness that the environment influences disease dates back at least to the time of Hippocrates. The first proven case of an illness linked to an environmental cause did not occur, however, until 1854 in London when physician John Snow showed that water pollution was responsible for a local outbreak of cholera. His proof was simple: after disabling the use of a contaminated well by removing its pump handle, a subsequent reduction in new cholera cases was noted. The bacterial contamination of water polluted by human or animal wastes was probably the most common environmental problem of the preindustrial world. Its control in the twentieth century represents one of the greatest triumphs of public health. The chlorination of public drinking water to prevent waterborne diseases began in the early 1900s in the United States and is responsible for the virtual elimination of cholera, typhoid, dysentery, and hepatitis A in this country. Pollution itself, particularly from human activities, is not a modern phenomenon. The preindustrialized world certainly offered many opportunities for a polluted existence. Wood fires, the close proximity of livestock, and mining and smelting operations all would have presented conditions for polluting either the air or water, or both. Following the Industrial Revolution, however, the combined concentrations of people and industrialized processes conspired to create pockets of intensely polluted environments. 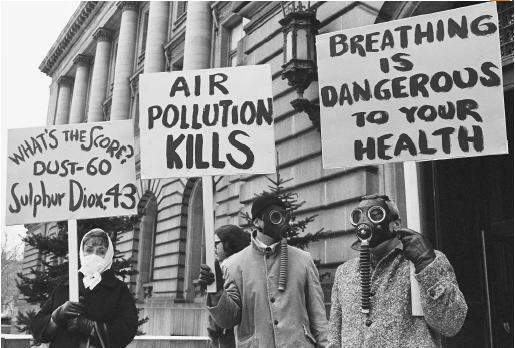 For instance, the air surrounding Pittsburgh, Pennsylvania, and other steel mill towns was laden with particulates, and pulp and paper mills would release the stench of sulphurous gases into the air and discharge dioxin-contaminated effluents into the water. Such activities, though, brought with them jobs and the financial incentive for communities to ignore the noxious conditions under which some were forced to live. This level of tolerance did not last, however. In the post-World War II world, several incidents around the world began to focus attention on the consequences of polluting the natural environment. One of these incidents occurred in 1948 in the steel mill town of Donora, Pennsylvania. A pollutant-induced smog was found to be responsible for twenty-one deaths, providing clear proof that the effects of air pollution were not limited to aesthetics. Later, in 1952, London, England, also experienced a "killer smog" blamed for the deaths of 4,000 people. Governments began to act to protect the air from industrial and automobile pollution. What these examples had in common was that the connection between a pollutant and a health outcome was fairly unambiguous. Severe illness and death were the end points examined and both would occur fairly soon after exposure to a highly polluted situation. This lack of ambiguity was vital in fueling the determination to reduce pollutant levels, regardless of the economic costs to some industries. The pollution control measures enacted led to improvements in environmental quality. But were they enough? In 1962 Rachel Carson published Silent Spring, alerting the world to the unintended consequences of chemical pesticide use. Her concern was the rampant use, and often overuse, of insecticides, fungicides, and herbicides in the post-World War II world. Not confined to agricultural fields, these products leached into ground water, rivers, lakes, and the food supply. Her book brought to the political arena the concept that synthetic chemicals could be responsible for cancer and other diseases. Her warnings proved prescient. The chlorinated hydrocarbons, such as the insecticide DDT (dichlorodiphenyltrichloroethane) [1,1-trichloro-2,2-bis( p -chlorophenyl)ethane] and its metabolite DDE (dichlorodiphenyl dichloroethylene) [1,1-dichloro-2,2-bis( p -chlorophenyl)ethylene], were discovered to not only persist in the environment but to concentrate at greater than ambient levels as they moved up the food chain. Many of these compounds, DDT and DDE included, have the ability to interfere with normal hormone levels in the body, leading to the disruption of endocrine systems. DDT was found to cause thinning of eggshells and a subsequent drop in the population of large birds of prey such as the eagle. This information led to the banning of DDT in the United States in the 1970s. Although DDT was outlawed based on evidence that it was a reproductive toxin in some wildlife species, evidence now exists that it is also a human reproductive toxin. Recent analysis of serum taken from pregnant mothers enrolled in the U.S. Collaborative Perinatal Project during the 1960s revealed that women exposed to DDE were more likely to give birth prematurely, and to babies who were unusually small. Both of these events can adversely affect the infant's long-term health. can often mask very real effects that occur in a sensitive segment of the population. The second difficulty is that age and the timing of exposures can greatly influence both sensitivity to an environmental agent and the type of health effect it will cause. Infants and children can be particularly vulnerable and can sustain lifelong damage at exposures that have no impact in adults. As an example, the metal lead is a known neurotoxicant . At high exposures of lead (80 μg/dL or higher in the bloodstream), encephalopathy, epilepsy, mental retardation, and blindness are the probable outcomes. Thus fifty years ago a level of 60 μg/dL of lead would be acceptable because immediate neurological symptoms did not occur in adults at these levels. © Angela Hampton; Ecoscene/Corbis. Reproduced by permission. regulatory standards based on studies in adults can potentially fail to protect children and other sensitive groups. Childhood is not the only vulnerable life stage. Puberty could represent another sensitive time point. Exposure to hormonally active agents (HAA) such as DDT, polycholorinated biphenyls (PCBs), dioxins, and certain classes of plasticizers, could adversely affect hormonally sensitive tissue, such as breast tissue. For example, women exposed to these compounds might be at greater risk of breast cancer, particularly if their exposures occur around puberty. The critical exposures could occur much earlier than clinical manifestations of disease, though, making it difficult to establish an association between the exposure and breast cancer. Additionally, the aging body might be less able to hold up against a lifetime of low-level, but persistent, environmental assaults and could begin to experience neurodegeneration , cancers, or heart disease as a consequence. Most diseases arise from the interaction of several events: an individual's inherited genetic susceptibility, his or her subsequent environmental exposures, and modifying factors such as behavior, age, and the time of exposure. The health consequences of low-level environmental exposures are more likely to be discovered when studies are designed to accommodate this greater complexity of knowledge. The payoff of such knowledge is potentially tremendous because the environment has been shown to play a role in so many chronic diseases. Recent twin studies in Scandinavia show that non-genetic influences, presumably environmental, account for more than 50 percent of cancer risk. For Parkinson's disease, environmental triggers might account for the greater number of late-onset diagnoses. And for auto-immune diseases, the concordance among identical twins usually falls in the 25- to 40-percent range, suggesting that environmental influences have a major impact on either the initiation or progression of these diseases. Thus, accurate and realistic assessments of environmental contributions to diseases are critical. Fortunately, the United States Department of Health and Human Services (DHHS), through its Human Genome Project [see sidebar], is providing the tools necessary for a more thorough investigation of gene-environment interactions in disease development. This project has identified the nucleotide sequences of human genes, including environmental response genes. Additionally, it has led to the development of new assaying techniques that can assess the activity (or expression) of hundreds of genes simultaneously. These events create the opportunity to systematically catalogue the genetic variation of environmental response genes and to determine the biological consequence of these variations. This information, generated by the United States Environmental Genome Project (funded by the National Institute of Environmental Health Sciences and found on their web site http://niehs.nih.gov ), can subsequently be used in population studies to determine the health effects of environmental pollutants at relatively low exposure levels. Human understanding of environmental disease risks is constantly evolving. New understanding, particularly of how individuals differ in response to environmental agents, will reveal new public health strategies. Even current successes, such as the chlorination of water supplies mentioned earlier, are being reassessed. It is now known that organic compounds in water can react with chlorination to produce halogenated organic compounds that are suspected bladder carcinogens. Though the cancers potentially caused by these disinfection by-products are much less frequent than the deaths that would occur without disinfection, they are nonetheless troubling. New technologies such as chloramination and ozonation are increasingly being substituted for chlorination and may lead to even better public benefit from water disinfection. Environmental regulation and pollution control will remain an important cornerstone of public health policy in the twenty-first century. Because the focus is on prevention, rather than disease treatment, pollution control is a highly cost-effective means of ensuring public health. The cost-effectiveness can only be realized, however, when it is based on an accurate determination of the real human health consequences of environmental exposures. This information is well worth generating, given the broad array of environmentally associated diseases. These include cancer, infertility, autoimmune diseases, birth defects, heart disease, and neurodegeneration. In addition to regulatory policy, pollution control can also affect social policy. In the United States there is a measurable disparity in the health status of poor populations compared to their affluent counterparts. Given that the poor more often live in contaminated environments and work in hazardous occupations, improved pollution control might well lead to a reduction in such current health disparities. It is only when the health of all citizens is protected that a nation can realize its full potential. SEE ALSO A SBESTOS ; A STHMA ; C ANCER ; C RYPTOSPORIDIOSIS ; DDT (D ICHLORODIPHENYL T RICHLOROETHANE ) ; D ONORA , P ENNSYLVANIA ; E NDOCRINE D ISRUPTION ; I NDOOR A IR P OLLUTION ; L EAD ; M ERCURY ; R ISK ; S NOW , J OHN ; W ATER T REATMENT . Carson, Rachel. (1962). Silent Spring. New York: Houghton Mifflin. Goyer, R.A. (1996). "Toxic Effects of Metals." In Casarett and Doull's Toxicology: The Basic Science of Poisons, 5th edition, edited by C.D. Klassen. New York: McGraw-Hill, pp. 691–736. Lichtenstein P., et al. (2000). "Environmental and Heritable Factors in the Causation of Cancer." In New England Journal of Medicine 343:78–85. Longnecker, M.P. ; Klebanoff, M.A. ; Zhou, H.; and Brock, J.W. (2001). "Association between Maternal Serum Concentration of the DDT Metabolite DDE and Preterm and Small-for-Gestational-Age Babies at Birth." Lancet 358:110–114. Needleman, H.L., and Gatsonis, C.A. (1990). "Low-level Lead Exposure and the IQ of Children." Journal of the American Medical Association 263:673–678. Needleman, H.L. ; Riess, J.A. ; Tobin, M.J.; Biesecker, G.E. ; and Greenhouse, J.B. (1996). "Bone Lead Levels and Delinquent Behavior." Journal of the American Medical Association 275:363–369. Powell J.J.; Van de Water, J.; and Gershwin M.E. (1999). "Evidence for the Role of Environmental Agents in the Initiation or Progression of Autoimmune Conditions." Environmental Health Perspectives 107, suppl. 5:667–672. Tanner C.M., et al. (1999). "Parkinson Disease in Twins: An Etiologic Study." Journal of the American Medical Association 281:341–346. Diarrheal diseases (caused by unsafe water, inadequate sanitation, and poor hygiene) and acute respiratory infections associated with indoor air pollution caused by burning wood, peat and other biomass fuels killed at least three million children under age five in the year 2000. The World Health Organization says that 40 percent of global disease caused by environmental factors falls on children. The Human Genome Project (HGP) is an international research effort to sequence and map all of the genes—together known as the genome—of humans. Many of these genes are environmental response genes and are being further investigated under the Environmental Genome Project for their role in environmentally associated diseases. Contributors to the HGP include the National Institutes of Health (NIH), the U.S. Department of Energy (DOE), numerous universities throughout the United States, and international partners in the United Kingdom, France, Germany, Japan, and China. The HGP also includes efforts to characterize and sequence the entire genomes of several other organisms, many of which are used extensively in biological research. These organisms include mice, fruit flies, and roundworms. Identification of the sequence or function of genes in model organisms is an important approach to finding and understanding the function of human genes. Information on the HGP can be found on the website of the National Human Genome Research Institute (NHGRI) at http://www.nhgri.nih.gov .